Dave Gallagher goes over Dennis Borruso's character design that Dennis is planning on modeling in 3D. In this Review Dave discusses line flow, straights vs curves, and the spacing of facial features. Come join all the students learning online at AnimSchool. Apply for the Fall Term now! 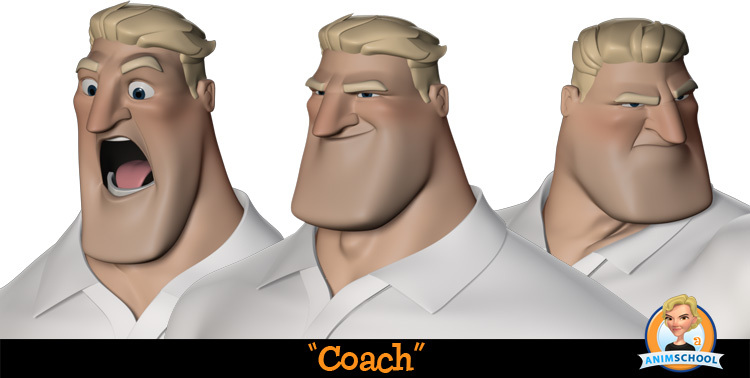 Orem, UT United States - August 20, 2013 -- Animschool announces today their new character, Coach. 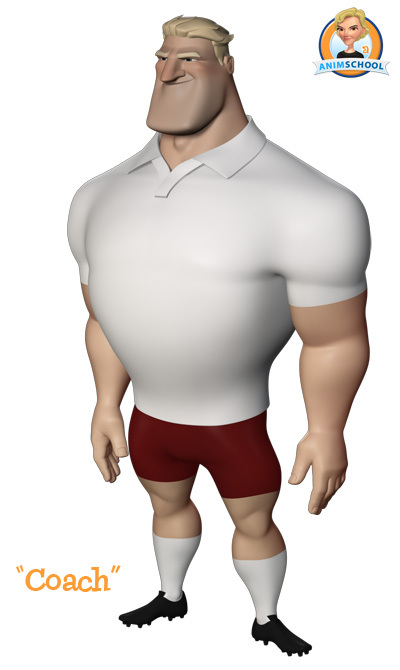 Coach is a fully articulated character rig, similar in quality to what a student would find at top animation studios, capable of a wide range of expression. Coach is exclusively for AnimSchool students. Like all AnimSchool character rigs, Coach is designed for maximum flexibility and appealing poses. Using the most refined, advanced characters allows AnimSchool student work to stand out among competitors. 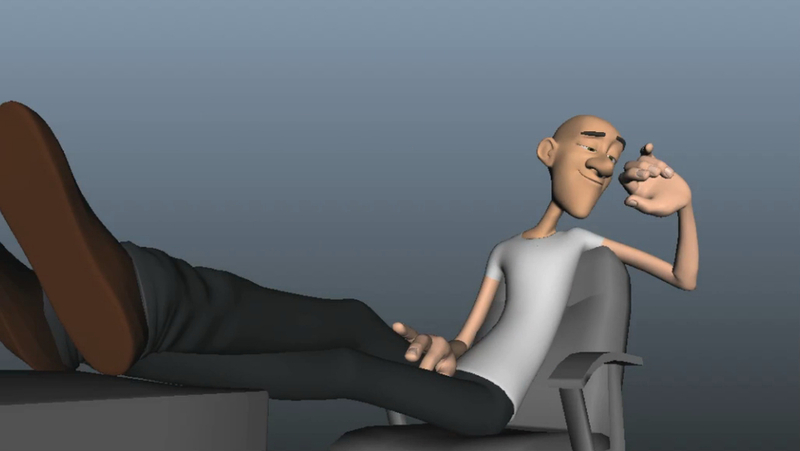 AnimSchool Character students can use Coach to learn the arts of high-end modeling and rigging. Coach has clothing options: shirt, collar, cleats, shoes, pants or gym shorts, and UV's for textured rendering. AnimSchool characters are used by more than 15,000 users worldwide, and have been used to win numerous animation contests and for commercial needs. AnimSchool is known as the most trusted name for appealing 3D characters. Now with over 200 students, AnimSchool was founded in 2010 to bring character-focused 3D animation instruction to students all around the world through live online sessions with the very best film professionals. In Part 3 of AnimSchool's Webcast with Blue Sky Senior Animator Lluis Llobera, Lluis discusses the relationship between Nigel and his human partner, Marcel. Coming up in Part 4, Lluis breaks down a shot in Rio from Layout to Polish. We'd like to introduce Sungmin Hong. Min, can you tell us a little about yourself and what 3D experience you've had before AnimSchool? Since I was a child, I have been into Manga and have drawn my own comic series in which me and my buddies were the main characters. I naturally realized that this was something I was good at. However, as I entered into high school, I was forced to study many subjects other than Art. Of course, because I neglected my drawing skills, I couldn't get in the top animation university, so I chose Design as my major at my college. Unfortunately, 2 years of studying Art wouldn't get me anything after graduation, so I quickly decided to go abroad to make myself a bit more fluent in English. While I was in Toronto, I found out there was a 1 year Computer Animation course at Sheridan College, so I jumped in right away. I believe that was the first important turning point of my life, where I got to learn 3D software 'Maya'. It was an intense course, but very worth it. I learned all aspects of the program. I can model, rig, animate, light and render. These are the good benefits of working in a small studio where you have to know a bit of everything :) While in the course many of my classmates told me that I specifically had potential in animation. After the program, I got a job as a 3D Artist. It was fun and nice to get to know many great people in the gaming field, but I realized that I really needed to amp up and better myself. Shortly I enrolled in AnimSchool. And, I gotta say, 'It was the second most important turning point of my life'. Student Sungmin Hong - Class 4 Body Acting from AnimSchool on Vimeo. What inspired you to get into animation? What do you enjoy the most about animating? As many people in the Art Industry do, I was wondering if Art was a direction for me, because I couldn't draw nor paint well enough. But, I trusted that there must be something other than drawing and painting. I found out I had a good eye for things, I could observe how things move, how people move, and how to make it more interesting. After that, I realized it was the Animation Industry I would like to pursue for my career. And, 3D helps me to overcome my drawing skills. Although, I still think having good 2D Drawing skills can be very helpful. Which Artists inspire you and what do you love about them? Honestly, I got into animation late, but it's been a couple of years since I searched and viewed Glen Keane's pencil tests and lectures on Youtube. I couldn't believe my eyes that he was making magic on paper. Of course, I love everything he's made, but I especially love when he uses a shoulder to express the feeling. I think it was when the Little Mermaid is singing on the rock and Glen pushes her shoulder all the way up to her face. It was very appealing and expressive. His thought on every single pencil move has a lesson for me, so I watch his videos when I feel I need some inspiration. With every AnimSchool test comes new challenges. Out of all the tests you've completed, which one has been the most challenging and why? With no hesitation I would say the 'Character Performance' shot where a sassy girl argues on the couch. The shot was the most known shot among mine, but surely was very challenging. It was certainly hard to come up with the acting, so I decided to study a friend of mine who likely matches the character in the audio and it worked. We came up with a great reference and my first blocking was great. But there were 3 major challenges in my blocking and reference. First, it was absolutely challenging to extract the character I wanted for the shot. After the first blocking, I felt a lack of character, even though I liked the hand and leg movement. After struggling, I got the solution from instructors that I needed to use her neck, not just to layer the movement, but to give character. So, I made sure she pushed her neck as she spoke more and it helped in terms of accent and character for the shot. Secondly at one part, I had the character reacting quickly when the line starts (when she says 'nah ah'). It was too fake and unnatural, as if she knew what she was going to say before hearing what he says. As instructors suggested, I fixed it so that she reacts (facially) before she says 'nah ah'. This became a lot more believable and natural. The last issue was the timing and transition between poses. Because in the reference, I picked 3 favorites from each part and edited those together. So between the edited parts, I had to figure out a nice way to transition, especially the last part where she readjusts herself with her legs pulled more inward. In that part, poses between the cut was too broad, therefore it felt too fast. I had to spend lots of time getting the right timing and fix the acting a bit. Student Sungmin Hong - Class 5 Character Performance from AnimSchool on Vimeo. Can you talk a little about the process of your dialogue test from the Character Performance class, from coming up with the background story, your video reference, to splining. -audio: I picked two audio clips from the movie 'Juno' because I thought her voice was very unique and had a strong personality, so that I could come up with the character better. -reference: As I mentioned, I invited my friend and had a little lunch and conversation with her. As Jeff Gabor did for Linda in the movie 'Rio', I studied her movement, every little detail. I even found out that the way she sits on a couch was very interesting, so I used it. After the conversation, we discussed what kind of gestures or acting she would do in this shot. She thankfully did a few shots for me and it was great. One thing I was glad about, I didn't watch the movie. It ultimately helped me to not limit my thoughts on the character of the shot (in my shot she seems a lot more active than Juno in the movie). -blocking: I normally do 3-4 main story poses for the shot. Then breakdown and do more breakdowns. All of my instructors (mostly from Blue Sky) have taught me to do the blocking in stepped mode. At the end of the blocking stage, I have keyed every 2-3 frames. So, when I do a playblast, I could see how it feels when it's splined. (I spend more time in blocking then in spline). -splining : I just spend time adjusting the curves. -polishing: I focus on facial details and little things like fingers and accent and so on. This is where I spend a lot of time trying to give extra life to the character. Example: I gave more of an accent on the 'Punk' part by opening the mouth in 1 frame to give more 'Pop' feeling. This little detail can really fix the spliny feeling of the shot. Student Min Hong - Class 6 Facial Performance from AnimSchool on Vimeo. Your class 6, Facial Performance test is a great piece, what were some of the challenges you had with this shot? 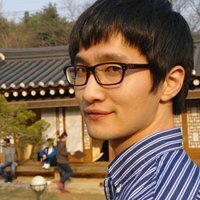 Can you share some of the feedback you received from your instructor that you found valuable to the piece. First of all, the shot is still in progress.. I didn't have enough time to polish the shot, since I had to move out to a new place :) But yeah, my instructor 'Melvin Tan' helped me so much the achieve the quality I have. I remember he said the pose for the 'Personality' part was too broad in terms of the transition between poses at 'you got a' and 'Ah.. that's so rich'. Because previously in the blocking I made him leaning backward into the chair and that made his spine straighten up too much so that there was no space for him to go backward for the 'that's so rich' part. And it felt too dynamic for the 'personality' part, so Melvin's suggestion was to move his spine a bit closer to the previous pose helping the audience see other parts like facial and fingers. It's also more clear to see him leaning back on the chair in the end. In my reference, I was sitting on the chair acting it out in front of the camera. Then, Melvin suggested to put his legs on a small chair or something to convey his dominating position in the shot and it worked out very well. It helped not only the personality of the character, but it also looks good in terms of the silhouette. Melvin gave a lot of directions for the mouth shapes, which was great because, I had been struggling with the facial expressions for the shot. Since the shot was very sarcastic, he wanted me to push lots of his mouth and facial poses. A good example is when he says 'Personality'. Previously, his mouth shape was small and moved only up and down, but Melvin told me to use the arc and even the forward and backward of the chin. I didn't even realize how much it would give the character by simply moving his jaw forward and backward. It was literary one of the best critiques on facial expression I have got through the course. Great! As I mentioned, it was the best turning point of my life. Without Animschool, I could not have been here sharing my experience. What's your favorite thing you've learned so far? Everything. I was really new to this animation world and in every class I learned things I have never known before. After talking with students from other online schools, I realized how lucky I am for choosing Animschool over others. There is one great thing about the school, the lecture is given from your own instructor from each class. It is not pre-recorded, which means every instructor has their own style and things to focus on during the lecture. For example, I have learned how to use tools and scripts. How to block from Michael Richard. How to analyze reference from Tony Bonilla. How to give more expressive character from JP San. Important things to consider in each stage from Garrett Shikuma. And, briliant acting lesson from Melvin Tan. What advice would you give other students that are just getting into animation? See people on a street. How they walk, what they do in certain situations. Think why they do that? What makes them do that? DreamWorks Supervising Animator, Hans Dastrup reviews AnimSchool student, Jilmar Altamirano. In this review, Hans goes over Jilmar's first blocking pass, making sure each pose supports the story being told.